Once again Windjammer Landing Villa Beach Resort has received accolades as one of the top family-friendly hotels across the globe by Family Vacation Critic, Trip Advisor’s family travel site. To coincide with this award, Windjammer Landing launches its latest package for families, The Saint Lucia Family Getaway Package, with savings up to 40% off. “All hotels on TripAdvisor’s Family Vacation Critic site are great for families, but winning this distinction as a ‘Favorite’ means we go above and beyond,” noted Scott Seger, managing director at Windjammer Landing Villa Beach Resort. Twenty hours of complimentary nanny services from 9AM – 5PM, so parents can get some alone time or enjoy The Spa. A Windjammer Landing Villa Beach Resort all-inclusive vacation includes accommodations; all meals and beverages at five on-property restaurants and four bars; the luxury of six swimming pools; a 24-hour fitness center; water sports, including waterskiing, snorkeling and windsurfing; complimentary Wi-Fi resort wide; Jacquot Fun Club with supervised daily activities for children 4–12 years of age; and teen activities for kids 13–17. Accommodations at Windjammer Landing are luxurious, functional and ideal for families. The villas at the resort have breathtaking ocean views and ample space to enjoy each other's company or retreat for some alone time. Ranging in size from one to five bedrooms, the villas also feature a full-kitchen, living and dining areas, and either a private plunge pool or is located steps away from one of the six pools available at the resort. The Jacquot Fun Club offers a supervised program of daily activities ranging from outdoor play and crafts to local culture for children ages 4-12. Children will engage in nature hikes, shell hunts, bottle fishing, crab races, coconut bowling, face painting, boat rides, cooking lessons and swimming to name a few. Plus, they will be introduced to Saint Lucian culture, learning about patois (local language), as well as limbo and reggae dance moves. Themed evening activities include pajama, pirate, talent, disco and pizza parties. Windjammer Landing recognizes the need to please their teen guests, and have plenty of activities suited just for them, including waterskiing, a floating trampoline, an “iceberg” climbing wall, snorkeling, sailing, kayaking, windsurfing and raft rides. Relaxing in one of the overwater hammocks is also a favorite among teens. Changing daily, organized activities geared towards teens include beach volleyball, beach parties and water polo, to name a few. Complimentary activities are scheduled throughout the day where families can join together for fun and games, such as stand up paddle boarding, beach volley ball, corn hole contests, water polo, water balloon fights, table tennis, beach cricket, and more. Windjammer Landing’s family-friendly attitude also extends to The Spa with their “Petite Spa Experience” for children 8 years old and up, and the Dive Center, also with programming for those as young as 8 years old. Plus, the resort encourages families to immersive themselves in the beauty and culture of St. Lucia by providing an on-site tour desk. Jammin’ Tours provides half-day, full-day and customized tours to suit every family, some highlights include: sailboat and jeep tours, rain forest zip-line and gondola tours, volcano tours, deep-sea fishing, dolphin and whale watching, horseback riding, helicopter tours, plantation and historical tours, and many other family-friendly options. For more information or to make reservations, call (877) 522-0722 from the U.S. or Canada and 0808.101.7261 from the United Kingdom. Find Windjammer Landing on Facebook, Instagram, Twitter, Pinterest and at http://www.windjammer-landing.com. Welcoming its first guests in 1989, Windjammer Landing Villa Beach Resort was designed by Barbadian architect Ian Morrison to look like a Mediterranean village. Brick paths meander through more than 60 acres of lush landscaping, scented gardens, sparkling pools, covered walkways, and hand-painted tiles. Recently, the property invested more than US$42 million into resort enhancements, upgrades and expansions, including the addition of North Point, a new beachfront section of three- and four-bedroom luxury villas, and the creation of The Spa at Windjammer Landing. 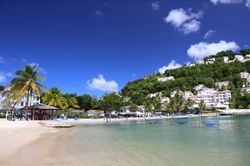 Ideal for all types of families and multi-generational travelers, Windjammer Landing is renowned for its welcoming atmosphere, friendly staff, extensive activities, and signature all-inclusive vacation. Guests enjoy “Barefoot Luxury” with the perfect balance of culture, wellness, entertainment and adventure. Windjammer Landing is 32 miles from Hewanorra International Airport (UVF) and five miles from George F L Charles Airport (SLU). Sample flight times from major cities include three-and-a-half hours from Miami, four hours from New York and five hours from Toronto.